In 2011 I made my first attempts to ride mostly in the freestyle / pegger method of riding. In retrospect, I think I must have been riding with a large amount of my bodyweight supported by my wrists. If you have followed this blog, you will know that I have skinny, weak, girls wrists, so this is a bad thing. I am certain that I stretched tendons and put a lot of pressure on my median nerve during that period and suffered mildy from the ill effects for many weeks afterwards. 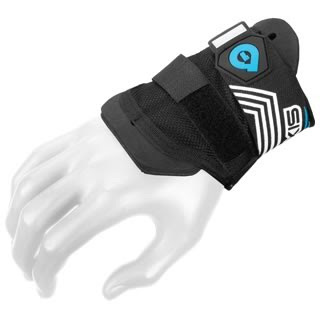 For the 2012 season I was determined to amortise the risk of similar symptoms re-occuring and also guard against wrist fractures due to hyper-extension during the anticipated crashes and wipeouts. True to form, I had many crashes and wipeouts during th 2012 season, during some of which, I really thought I was going to do permanent damage. Whether these wrist braces were a placebo or whether they really did save my physical integrity I will never know. All I can be certain of is that; they were comfortable to wear, easy to put on and it did me know harm to have them and I would have felt naked on a skibike without them. After roughly four weeks of use, they are beginning to look worn, I had hoped that they would be a bit tougher for the money.